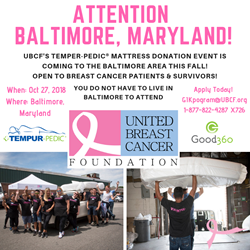 HUNTINGTON STATION, N.Y. (PRWEB) OCTOBER 25, 2018 – The United Breast Cancer Foundation (UBCF) is pleased to partner with Good360 to provide Tempur-Pedic® mattresses at no cost to breast cancer patients and survivors. 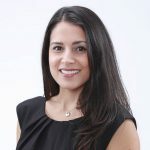 The trusted Tempur-Pedic® Mattress brand offers the comfort and support necessary to promote a good night’s sleep, something that is vitally important to the healing process and improving the quality of life for those touched by breast cancer. On Saturday October 27th in Owings Mills, MD, UBCF will be giving away 280 mattresses to male and female breast cancer patients, survivors and their children 18 or younger. For more information please contact Kerrin at #877-822-4287 x 726 or email her at GIKProgram(at)ubcf.org. In addition to the new mattresses, the United Breast Cancer Foundation is giving away “Pink Bags” filled with other household items, clothes and personal care products from trusted brands like J.Jill, Talbots, Cabela, LL Bean, Leverage, Aritzia, Eddie Bauer, First Aid Beauty, Eos, Artistry, Julep, Earth Science, Regis, Burt’s Bees, Clean Bean Soap and Culligan water filters. Cancer care is expensive. Very often large purchases, such as mattresses, and other daily necessities are delayed or abandoned due to mounting medical bills. UBCF and its partners are there to help. This is the Foundation’s fourth large mattress event in the past 12 months.